The historic centre of Venice is on an island, connected by the Liberty Bridge (5km) to the mainland. Mestre is a large district of Venice commune on the mainland. About 140.000 inhabitants of Venice live in Mestre; 30.000 people live in Marghera, 30.000 on the Lido island and 60.000 in the historic centre. The advantage of staying in Mestre district is that the hotels are much cheaper than in the historic centre. Disadvantage is the long(er) travel time to the centre. Venice Mestre station is one of the busiest railway stations in Italy with 85.000 daily (through)travelers. The address is: Piazzale Favretti 1, 30170 Mestre. The station has facilities for disabled persons such as access ramps, a motorized wheelchair lift and a centre to assist disabled travellers. There is also a McDonald restaurant, a buffet (food/drinks), a tobacconist and a luggage storage. The train station is 7 km from St Lucia Station which is the end station of Venice. Nearby Santa Lucia Station is Piazzale Roma. This is a square with the Venice bus station and car terminals. The historic centre of Venice is a pedestrian zone. The journey between Mestre station and Santa Lucia Station takes 10 minutes. 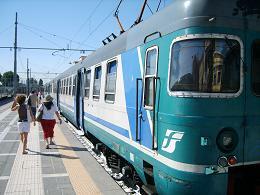 An one-way train ticket from Mestre station to Santa Lucia train station cost about €1. A ’72-hour Tourist Card’ has a regular price of €40 and includes not only the use of the public water buses but also the bus to Mestre. This bus stops at Mestre Station. 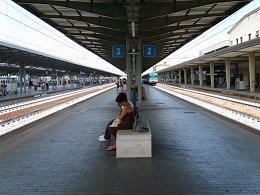 Travel time from Mestre train station to the Venice bus station is 12 minutes.